ScoobySnax.com is a site dedicated to the Scooby fans that has an extensive amount of info on Scooby-Doo and the various incarnations and forms of the franchise throughout the years. Some of the site's features include episode and movie guides, character info, info regarding home media releases, video games, Scooby-Doo LEGOs, and voice actors, as well as a history of the series, a collection of fanfiction and exclusive interviews with some of the show's crewmembers who have worked on Scooby-Doo! 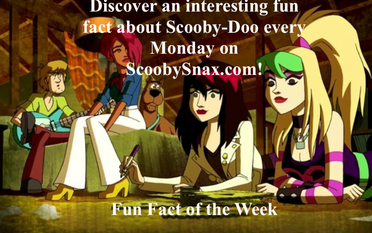 Be sure to also check out the site's blog, which features a variety of articles, the latest Scooby-Doo news and a fun fact about Scooby-Doo posted every Monday! I try to update the site often, so check back often for any new updates! April 18, 2019 - Updated the Movie Guide with new info on SCOOB! April 7, 2019 - Updated the Episode Releases Database, the List of Season Sets, and the List of Movie Releases to include the info about the newly announced New Scooby-Doo Movies lost episodes, What's New Scooby-Doo complete series, and 5 kid favorites sets. April 4, 2019 - Updated the Episode Releases Database, How to Have a Complete Scooby-Doo Collection and List of Season Sets to include the info about the newly announced New Scooby-Doo Movies lost episode sets.